To find the latest results from this weekend please click on the age group you need on the left hand side. Results will be put on between Sunday night and Wednesday night. It is up to each manager to send the results into the website designer. Tough day today for the U7s against an exceptional Boro Rangers side, but the lads all kept their heads up and chased down every single ball, trying their best for the whole game. Very proud of them for keeping going all through the game. U11s Reds played in a fantastic cup game today at Nunthorpe (who are in a much higher division than us) but we matched them all the way taking the game to penalties were the boys were unlucky but a great performance by all the Southpark team especially by our keeper Thomas Cardwell. U12 Blues lost to Stockton and Norton ancients 8-2, only 8 of the team played due to a few absent. Alfie Walsh got 2 goals. Fantastic effort from the team. SPR BLUE WON ON PENALTIES! Fantastic advertisement for grass roots football. 2 teams evenly matched on the day giving their all. Horrible way to lose but what a great feeling for the blues! U16 Reds lost 5-3 to a very physical thornaby team. But we move on to the next game with a lot of positives taken from the game! The Ladies went into the season in great form winning their first game 9-1 away to Huntington, we continued in the same manor picking up points and looking strong we suffered 2 major injuries to key players which meant a resuffle of player’s positions. We represented South Park once again in the FA cup away to penrith 4 leagues above us narrowly getting beat 3-2. As the season continued the league came to a halt and we had 11 weeks with no games which saw us loose our momentum and loose a couple of games aswell as drop a couple with 1-1 draws. Going into the last 8 days of the season we were 12 points off top spot and a minus 23 goal difference with 4 games left, with the top side still to play set for the last game of the season. We faced an away trip to Ripon who and the ladies traveling with a squad of 12 secured a 5-1 win next came a home game v Huntington and again the ladies came up trumps bagging a 13-0 win, next was a local derby v Middlesbrough women the ladies once again worked hard and won 7-1, the ladies had faced 3 games in 6 days and put themselves 3 point behind and 1 goal in front so it was all to play for in the last game. 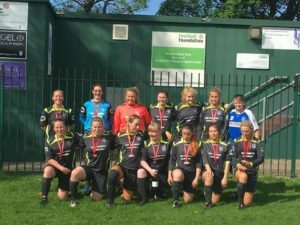 Unfortunately the fixture was set for a day when 30% of the team were unavailable and ended in defeat for the ladies however we did finish second in the league our highest finish since we started in the league 3 seasons ago, we also had the the higest individual goal scorer in the league with Eve Marshall scoring 48 goals. We are looking forward to the up coming season our transfer business has been done and we have 4 great additions to the already strong squad as we look to going one better in the 18/19 season.